The Pirates for Rangers closer Keone Kela, the teams announced Tuesday morning. Left-handed pitcher Taylor Hearn and a player to be named later are going back to Pittsburgh. Kela, 25, has pitched to a 3.44 ERA/138 ERA+ and 3.14 K/BB ratio in 36 2/3 innings this season. He's also converted 24 of 25 save opportunities. For his career, he's got an ERA+ of 132 across parts of four-big league seasons. Kela isn't eligible for free agency until after the 2021 season. Kela joins a Pittsburgh bullpen fronted by closer Felipe Vazquez, who has posted a 3.02 ERA/133 ERA+ and 3.5 K/BB ratio in 44 2/3 innings while racking up 23 saves. Hearn, 23, was the Pirates' No. 7 prospect, according to MLB.com. He went 3-6 with a 3.12 ERA and 107 strikeouts in 104 innings for Double-A Altoona prior to the trade and is said to have a top-notch fastball that can sit in the high 90s. The Rangers have an opening at closer with Keone Kela gone. I like Jose Leclerc, but Jake Diekman is a possibility as well. All three of these teams need outfield help, especially the Indians (see below), and McCutchen, who's in his walk year, would be a potential fit. This season, the 31-year-old former MVP is batting .253/.348/.405 (107 OPS+) 10 home runs, 24 doubles, and nine stolen bases in 103 games. McCutchen is stretched defensively in center these days (the Indians need help in center), but he's fine at a corner. He's owed the balance of a $14.75 million salary for 2018, which means the Yankees -- who want to stay under the luxury tax threshold -- would need to make the money work. Yes, Morosi indicates there's no momentum toward a deal. That said, there's still plenty of hours left until Tuesday afternoon's deadline, and it's possible that the Indians and Nats have discussed a general framework. The Indians are focused on adding an outfielder -- specifically a center fielder -- prior to the trade deadline, reports ESPN's Buster Olney. Olney opines Cleveland may be better off adding an infielder and shifting Kipnis to center field, where he played late last season and in the postseason. At the moment the Indians are using a Greg Allen/Rajai Davis platoon in center field with Melky Cabrera and Brandon Guyer sharing time in right. All-Star Michael Brantley is entrenched in left and both Tyler Naquin (hip), Lonnie Chisenhall (calf), and Bradley Zimmer (shoulder) are injured. The Indians can go in a number of different directions before the deadline, though it is clear they need an upgrade in center. While Harper isn't a natural in center he has put in more than 1,000 career defensive innings at the position. Yes, Harper's batting just .220 in his age-25 season, but his high walk and home run totals lift his OPS+ to 122. Needless to say, he's also got the skills to find his customary level at any moment. Given the low bar at the position, Harper would be a big upgrade for Cleveland even if he isn't a standout defender in center and even if he continues producing at the current level. The question for the Indians is whether they could put together a persuasive package after dipping into the farm system quite often for major trades in recent years -- including the Brad Hand deal with the Padres earlier this month. As for Rizzo and the Nationals, a case can be made the Nationals should trade Harper, though if they want to re-sign him, the best way to do that is to keep him at the deadline. 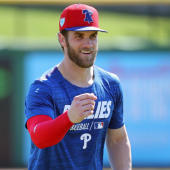 Even if the club trades Harper with the intention of re-signing him after the season, the odds of re-signing him go down as soon as he's traded. Any sense of loyalty is eliminated and Harper gets a taste of life in another organization. Whatever the case, it appears that trading Bryce Harper is no longer an unthinkable proposition for the Nationals. Granderson's in his walk year, and the lefty hitter can still be useful in platoon-advantaged situations. He can also play both outfield corners and serve as a stop-gap in center. According to MLB.com's Jon Morosi and T.R. Sullivan, the Rangers have discussed an Adrian Beltre trade with the Braves. Beltre has a full no-trade clause and has said he won't accept a trade to a team that doesn't plan to use him as a full-time player. The MLB.com scribes indicate Beltre is more open to a trade to a Red Sox, Astros, or Indians. Beltre, now 39, is hitting .292/.342/.404 with five home runs in 73 games this season. The power isn't really there anymore, but Beltre can still hit for average and get on base, plus he's a strong defensive third baseman. Add in strong clubhouse skills and you've got a great veteran rental for a team looking to get over the hump and into the postseason, if not the World Series. The Red Sox placed third baseman Rafael Devers on the disabled list over the weekend, and while he isn't expected to miss much time, Beltre is almost certainly the better player at the moment. Devers is hitting .246/.295/.425 with 15 home runs, but also 20 errors at third base. Beltre did play one season with Boston, remember, so he could be intrigued by a reunion. The Braves on Monday acquired Adam Duvall from the Reds in a four-player trade. Get the details here. The Red Sox have acquired 2B Ian Kinsler from the Angels in exchange for two minor-league pitchers. Get the details here. The Yankees on Monday acquired right-handed starter Lance Lynn from the Twins in exchange for first baseman/outfielder Tyler Austin, minor-league right-hander Luis Rijo and cash. Get the full details here. The Mariners on Monday acquired lefty reliever Zach Duke from the Twins in exchange for minor-league RHP Chase De Jong and minor-league infielder Ryan Costello. Duke in his age-35 season has pitched to a 3.62 ERA/121 ERA+ with a 2.60 K/BB ratio. He's yet to allow a home run in 37 1/3 innings. For his career he's owns a 3.20 ERA while pitching out of the bullpen. On the Twins' side, De Jong, 25, struggled in four starts and three relief appearances at the big-league level last season, but he's got better numbers in the minors. Costello, 22, has an OPS of .909 across parts of two minor-league seasons. This year, he's been at the Midwest League. He can play first or third. As it turns out, Jerry Dipoto wasn't done. The Mariners on Monday also reportedly acquired right-handed reliever Adam Warren from the Yankees. Get the details here. The Pirates have interest in Orioles right-handers Kevin Gausman and Mychal Givens, reports Stephen Nesbitt of the Pittsburgh Post-Gazette. The O's have done background work on Pittsburgh's farm system, though no deal is imminent. Despite their recent 13-3 stretch, the Pirates come into Monday four games back of the second wild-card spot with three teams ahead of them in the standings. Close enough to stay relevant but also not really in the thick of the race. SportsLine puts Pittsburgh's postseason odds at 6.5 percent. Gausman, 27, is under team control through 2020 and is viewed as a strong change of scenery candidate. The 2012 fourth overall pick has a 4.43 ERA with 104 strikeouts in 124 innings this year. Givens, 28, is under team control through 2021. He is in the middle of his worst season as a big leaguer, pitching to a 4.78 ERA in 52 2/3 relief innings. Chris Archer is not the only Rays player with a chance to move before the trade deadline. According to Marc Topkin of the Tampa Bay Times, the Rays are are in trade discussions regarding Adeiny Hechavarria, Sergio Romo, Wilson Ramos, and possibly others as well. Hechavarria, Romo, and Ramos are all impending free agents. Ramos is currently on the disabled list with a hamstring injury, though teams can trade injured players, and quality catching is so hard to find that I think contenders would trade for Ramos even before seeing him healthy. He's very productive and there is less than $3 million remaining on his contract this year, so he'd fit any budget. Ramos could very well be traded even while on the disabled list. As for Hechavarria and Romo, they don't figure to be as in-demand as Ramos. Romo is a right-handed specialist in a market flooded with relievers, which of course doesn't not mean he can't be traded. The return might not be significant, however. Hechavarria, a glove first shortstop, could fit with a team looking to cover for an injury or looking for a slick fielding utility infielder. After losing nine times in their last 15 games, the Cardinals are open to listening to offers for Bud Norris and Jose Martinez, reports Derrick Goold of the St. Louis Post-Dispatch. Norris is on a one-year contract and has been the team's best reliever all season. Martinez is under control through 2022 but does not have an obvious spot in the starting lineup. The 33-year-old Norris has saved 20 games with a 3.14 ERA and 55 strikeouts in 43 innings so far this season. The bullpen has been a weakness for the Cardinals all season, and trading Norris would be a clear sign the team is focusing on 2019 rather than 2018. The Cardinals are eight games back in the NL Central and five games back of the second wild-card spot. As for Martinez, the just turned 30-year-old owns a robust .294/.359/.461 batting line with 18 doubles and 13 home runs, but he is essentially a man without a position. He's a well-below-average defender in the corner outfield spots and at first base, positions the Cardinals have covered multiple times over. An American League team is the best fit for Martinez. Marlins sidewinder Brad Ziegler is "likely to be moved soon," reports Jon Heyman of Fancred.com. Heyman lists the Cubs and Red Sox as possible landing spots, with the Indians and Astros also potentially in the mix. Ziegler is in the final season of his two-year, $16 million contract. Ziegler has been traded at the deadline twice before and figures to be a solid pickup for a contending team looking to bolster their relief crew for the stretch run. Duvall likely to be traded? In addition to Matt Harvey, Reds outfielder Adam Duvall is drawing trade interest and could be on the move, reports Jon Heyman of Fancred.com. Closer Raisel Iglesias is available, but Heyman says it'll take a significant offer to part with him. Duvall, 29, is hitting a weak .205/.286/.399 with 15 home runs this season after back-to-back 30-homer seasons with Cincinnati. He is under team control through 2021, but with his offense slipping, it might not be long before the team believes his salary outweighs his on-field value. Duvall is a good left fielder defender, so he's not useless if he's not hitting. As it is, the Reds have four outfielders for three spots: Duvall, Billy Hamilton, Scott Schebler, and Jesse Winker. Winker is done for the season following shoulder, however.